I had the pleasure of visiting the Esther Honey Foundation during August, 2012. I had heard about the foundation and the wonderful work they did through a friend of the family. I wasn’t quite prepared for how much of an impact this clinic makes. Upon my arrival I was greeted by the Clinic Director Gregg Young. Gregg gave me a tour of the clinic and introduced me to the staff of Veterinarians that worked there. Cinzia, Pip and Helen were all volunteering during my visit and all three are truly amazing human beings. The love and care they provided to the animals was something that sometimes almost brought tears to my eyes. Their dedication to helping animals and to the people of the island is truly unmatched. When I was introduced to the animals that were being cared for at the clinic, it was love at first sight. There was no shortage of cuteness! All of the animals under the care of EHF were so unique, each had their own story. There was “George” the rambunctious pup who suffered a broken leg, he was on the mend but still needed his bandages changed every day. Then there was “Matt,” he was an older dog who came into the clinic with matted fur, hence the name! The volunteers at the clinic cleaned him up and gave him a great spot to lie down and rest right in front of the clinics entrance. The cats and kittens at the clinic were just as loved and cared for as the dogs. There was “Monday” and “Sunny” who both suffered from fish poisoning. They were both getting their sea legs (pun intended) back and, thanks to EHF, were on the road to recovery. Those were just two of the cats and two of the dogs that were there. I could go on and on about all the others that I met while at the clinic. There was even a goat that made a visit during my time there! All of their personalities and warm spirits captured my heart, an experience that would never have occurred without volunteering with EHF. I would recommend everyone to visit, donate, or volunteer with EHF. The good that EHF does goes well beyond the clinic doors. I was so impressed with how every person I spoke with had their personal story of appreciation for EHF. 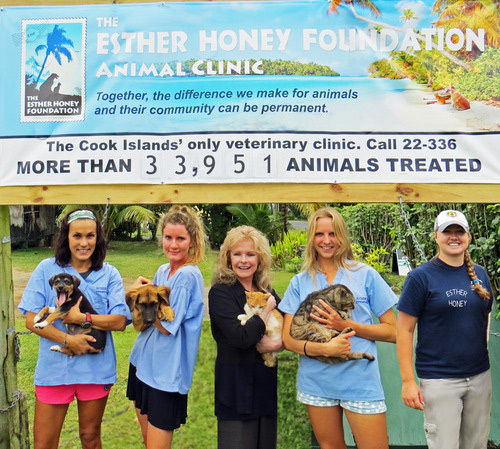 Whether EHF had helped their family pet in a time of need, or they got their new puppy at the clinic, they valued and loved having EHF as a member of their island family. EHF is a special organization that makes a difference each and every day for the animals and people of the Cook Islands.